"Perfect arrangements. I asked the company to arrange a two week Camino, one week on France (Le Puy Way) cross the Pyrenees and then one week in Spain (The French Way). All went off without any problems. 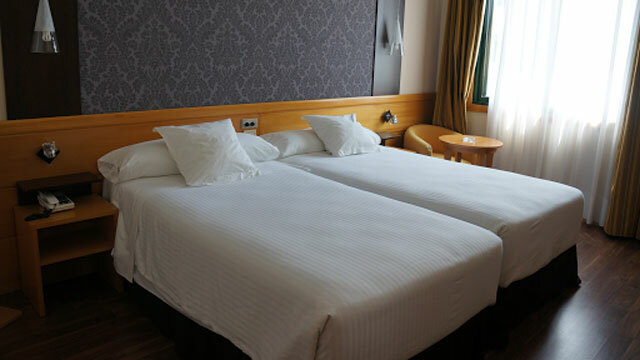 Good accommodation, set daily distances fair and my bag was delivered safely every day." This section of the Le Puy Camino, the Via Podiensis, takes pilgrims from the magical village of Conques to medieval Cahors; with the Lot River wrapped around the city’s historic centre. 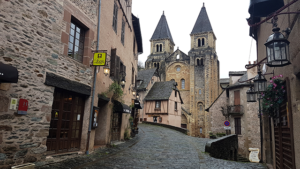 Conques and Cahors are probably two of the most beautiful towns of the whole Le Puy Camino route. This is a wonderful stretch of the Le Puy Way, taking walkers along forest tracks, lush farmland and rolling hills where you will enjoy magnificent views. 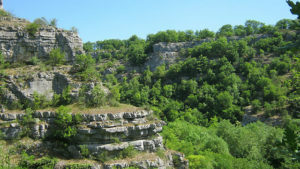 Also on this section, pilgrims will cross the Causses du Quercy natural park and pass the 3,500 year old dolmen of Pech Loglaire; as well as the oldest stone cross in the whole Le Puy Camino route. The Camino in France is marked as a GR Route with red and white stripes; as well as the traditional scallop shell and yellow markings. Today you leave the charming village of Conques walking down to the Dourdou River and crossing its medieval bridge. From here you will climb gradually to the chapel of Sainte Foy. The water from the small spring beside the chapel is said to cure tired eyes. 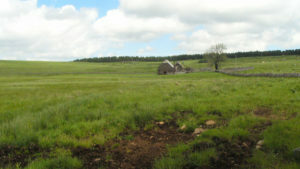 You will get fantastic views of the village as you leave it behind. The Le Puy Way then takes pilgrims through forests and lush green fields to the town of Decazeville, where you will be stopping for the night. On your way, it is worth stopping in the village of Noailhac and the chapel of Saint Roch; where you will get great views of the surrounding landscape; a peaceful spot for a picnic break. Today, you will notice the change in the landscape as you move from the Aveyron region into Le Lot. You will be climbing steadily for the first part of the day and will reach a great viewing point looking back at Decazeville. Your stop for the night is the pretty town of Figeac. From Figeac, the Via Podiensis Camino route climbs up to a high plateau so there are many ups and downs today; but the climbing is rewarded with fantastic views. The landscape is quite wild and you will also pass ancient dolmens, stone shelters unique to the region and stone crosses, including the oldest on the whole route. 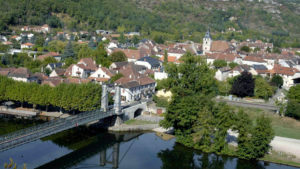 Your stop for the night is the peaceful town of Cajarc on the banks of the Lot River. Check out its 19th century suspension bridge (which replaced the original medieval stone bridge). 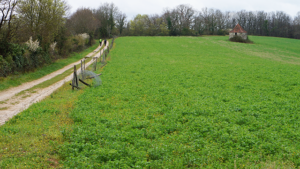 Today’s walk takes you trough peaceful woods and the agricultural lands of La Causse. It is quite an easy day’s walk, allowing you plenty of time to pace yourself, enjoy the walk and take in the lovely scenery. There aren’t many services until Limogne so make sure you pack water and snacks. The Le Puy trail follows mainly flat and peaceful woodland tracks today, as you continue your journey across the Les Causses Natural Park. On your way to Mas de Vers you will encounter more dolmens and stone structures. In Mas de Vers take the opportunity to taste the region’s most celebrated delicacy: the black truffle. From Mas de Vers your last walking day will take you to Cahors. You will again pass many stone shepherd shelters known as ‘caselle’, unique to the region. As you make your way down into medieval Cahors you will get fantastic views. 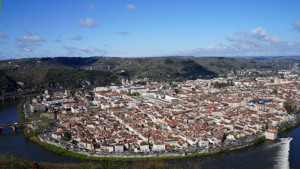 The small city of Cahors, surrounded by steep cliffs and the Lot River, is one of the nicest towns in the whole Le Puy Camino route. It is definitely worth spending an extra day to explore its historic centre, wander its quaint little lanes lined by wooden framed medieval buildings, go for a stroll along the Lot River, cross the iconic 14th century Valentré Bridge and pay a visit to Saint-Etienne Cathedral. Rodez Airport 40km: The easiest option is to take the bus (mon-fri): There is one bus per day, taking 1h-1h30. See www.tourisme-conques.fr. 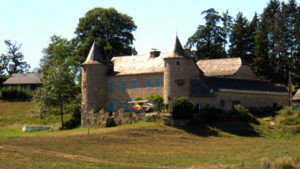 To take the train to Rodez you will need to change in either Severac or Millau: Between Aumont-Aubrac and Severac le Chateau/ Millau, an “autocar” (coach bus) links the train stations, while between Severac or Millau and Rodez, a train connection is available. The complete route can be taken twice a day, one via Millau and the second via Severac. Travel time is 2h30 (via Severac) and 3h45 (via Millau)). See www.voyages-sncf.com. Unfortunately, there is no public transport service between Rodez town centre and the airport, but it is possible to take a taxi. See www.rodezairport.com. A direct train route from/ to Paris (Gare d’Austerlitz) is available (5 times/ day, taking approx 5h15.). See www.voyages-sncf.com. From/ to CDG-airport from/ to Paris d’Austerlitz: From the airport, take the RER train to St. Michel (Notre dame, 45min travel time). From this station, there is a metro (line 10) to Paris d’Austerlitz (10min). See http://www.parisaeroport.fr/en/homepage. OPTIONAL: You will also have the option to add or remove the Luggage transfers (one bag up to 15 kg per person), dinners (where available), bike rental and airport transfers.